I had a similar experience. A couple of years ago I had quite a few CBs, but with new great artisans emerging I sold all my CB soaps. Recently, I was intrigued by their soft cream 322, which I managed to procure. I added to my purchase a container of the V SE soap. Both of these turned out to be extraordinarily good. Scents, performance and post shave feel are TOP notch. (12-27-2017, 08:31 PM)ANG69 Wrote: I had a similar experience. A couple of years ago I had quite a few CBs, but with new great artisans emerging I sold all my CB soaps. Recently, I was intrigued by their soft cream 322, which I managed to procure. I added to my purchase a container of the V SE soap. ^This. The luxury cream formula is outstanding. I haven't tried their "luxury soap" version, but I am intrigued now. I will definitely have to give it a shot eventually. I feel bad for not giving Cuties bubbles another try. Like you said it lathered and performed great. 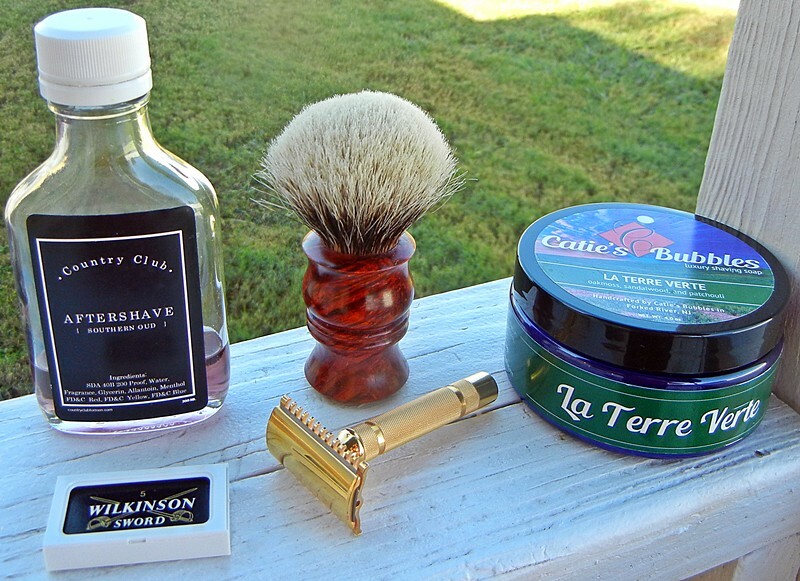 I had only used tallow soaps except for some tuned creams, and it performed as well as anything I had in my rotation. Unfortunately the LPV burned my face and i traded it off and never replaced it with any other Caties soaps. Since then I've tried some other veggie soaps and like their performance as well and have no issues of using them. Some days I prefer to use them. Hope to give Caties a try again soon. I’ve only tried one sample of the original formula, but the performance was good and the Irish Coffee scent simply outstanding. When I look at the ingredient list of the current luxury shaving soap, it isn’t as “flashy” as many of the new top bases you see out there. Yet I consistently read about how great the shaves with Catie’s Bubbles are. So I’m definitely looking into adding one or two of them into my collection at some point soon. It is one of my "Top Tier" soaps. My scent is La Terre Verte! Catie's Bubbles is one of my favorite artisans. I have many, many tubs of Chris' soaps and while I do prefer tallow bases his vegan base is in my top 10 soap bases which I guess says a lot. Aside from his soap bases (down to 2 bases for the unaware) his prices are very fair as he often pours heavy, his luxury soap base lasts for ever, you can load it super heavy and won't make a dent, his luxury cream base is one of the slickest soap bases and I do prefer it over his soap base but it's for limited edition releases. But his scents are just so freaking good and unique, nothing is basic. I'm pretty bored of basic scents easily and Chris doesn't do that. (12-28-2017, 06:05 PM)MattM97 Wrote: Catie's Bubbles is one of my favorite artisans. I have many, many tubs of Chris' soaps and while I do prefer tallow bases his vegan base is in my top 10 soap bases which I guess says a lot. Aside from his soap bases (down to 2 bases for the unaware) his prices are very fair as he often pours heavy, his luxury soap base lasts for ever, you can load it super heavy and won't make a dent, his luxury cream base is one of the slickest soap bases and I do prefer it over his soap base but it's for limited edition releases. That is my experience too. His scents are very well done. Not weird. Not quirky. Not "its growing on me. I can't recall a single scent I found off putting. Honey Noir was not a favorite but a son loves it and took it home. La Terre Vert. Ahhhhh. And Hondo, is that a replate on the Gillette OC or did you find a NOS somewhere. Mthat thing is beautiful. I am a member of the tallow "Taliban" as well, but I have sampled Sudsy Soapery and also Tabula Rasa vegan soaps and they do indeed bridge the tallow "gap". One day I hope to try Catie's Bubbles as it seems to be in the same vein. The good people of this world are very far from being satisfied with each other and my arms are the best peacemakers.